A U.S. soldier sits in an armored vehicle on a road leading to the tense front line with Turkish-backed fighters, in Manbij, north Syria, April 4, 2018. The White House denied the suggestion from the French president that he convinced President Donald Trump to keep U.S. troops in Syria for the "long term." Macron’s remarks on Sunday had hinted at a major policy shift for Trump, who had said he wanted a U.S. departure from Syria “very soon.” But “our policy hasn’t changed,” White House spokeswoman Sarah Huckabee Sanders said, and Trump remains focused on defeating the Islamic State and on getting countries in the Persian Gulf to pick up the financial and military burden of Syria stabilization in the future. The United States, France and Britain have all offered official justifications for their joint military strike on Syrian chemical weapons sites last weekend, as well as their own version of what it means for Syria’s civil war. In London, British Prime Minister Theresa May rejected political criticism that she acted on Trump’s “whims” and said that her decision to send Royal Air Force warplanes to attack Syrian targets was not done as a favor to the U.S. president. Averting an “overwhelming humanitarian catastrophe is permissible under international law,” May said. Macron and Trump also have cited the preservation of international law against the use of chemical weapons, although Trump has said his constitutional powers to protect “U.S. interests” provided authority to order the strikes without congressional consultation. Russia, Syrian President Bashar al-Assad’s main backer, has said that an alleged chemical attack on April 7 in the Damascus suburb of Douma did not happen, and that it was a provocation staged by anti-Assad rebels. May said British confidence that the Syrian government was responsible for the chemical attack, which killed dozens of civilians, was based on “a significant body of information — including intelligence.” U.S. Defense Secretary Jim Mattis also alluded to unspecified “intelligence” that reached him last Friday and convinced him that the Syrian government was indisputably responsible for the attack. In both cases, the reference was based on electronic intercepts acquired by France and passed on to the United States and Britain, U.S. officials said. U.S. intelligence agencies declined to comment on the reported intercepts. 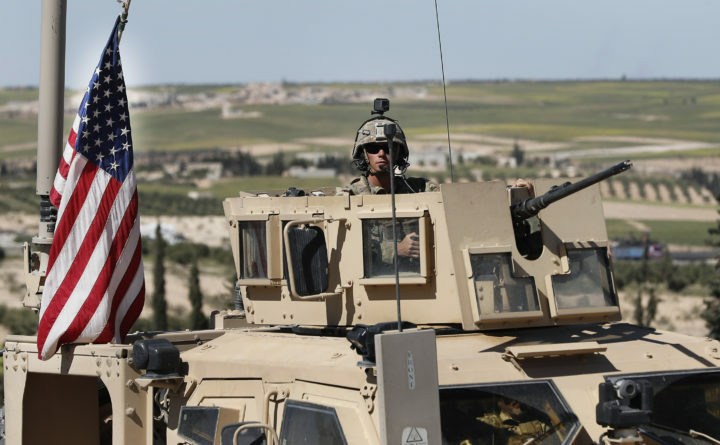 Although the administration has said its twofold strategy in Syria is to defeat the Islamic State and create conditions for a political settlement of Syria’s civil war, it has also said its own direct involvement only concerns the former. On Sunday, Macron said that despite Trump’s pledge to disengage from Syria, “we convinced him that it was necessary to stay there long term.” That brought a quick denial from the White House and a Monday attempt by Macron to at least partially backtrack. Speaking at a news conference during a visit to New Zealand, Macron said defeating the militants remains the military objective for France and the United States, and that the mission would end on “the day” that is accomplished. “I did not say” that either country “would remain militarily engaged in Syria in the long term,” he said. Trump remains unpopular in Britain and France. Both Macron and May are anxious not to appear subservient to the president, even as they try to convince him of the value of their alliance. That value, they hope, will pay dividends next month, when Trump must decide whether to drop out of the Iran nuclear deal to which all of them — along with Germany, Russia and China — are signatories.